Toddlers are just beginning to engage in pretend-play and our teachers plan engaging opportunities to inspire their play. 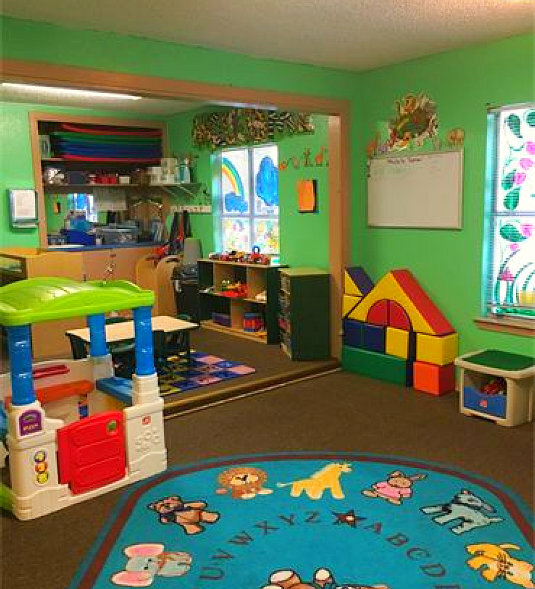 The environment we provide at All Kids 1st Learning Academy is full of activities that are perfect for toddlers. It allows them to discover and play independently or with others. The introduction to The Creative Curriculum begins here. This bilingual class, taught in English and Spanish, centers on guiding our students to become independent, creative children with great awareness of the world around them. Our teachers are nurturing and sensitive to the needs of each child, while encouraging them to develop the confidence to thrive in the preschool environment. Toddlers learn language naturally by hearing it used in context. Our students learn vocabulary by being spoken to, read to, listened to, and then encouraged to communicate their thoughts. Our teachers closely observe each toddler and individualize their teaching to challenge each child. Our toddlers discover the connection between spoken and written words by observing and experiencing them being used in the classroom. By utilizing dictation techniques, our teachers label the students artwork and activities to instill the lesson that their words have meaning. 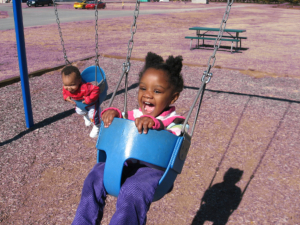 Toddlers enjoy the freedom of running around in our secure safe playground. Our Junior Playground is designed with the one to two year-old child in mind and boast a variety of areas for exploration and play. Gross motor skills are developed through activities such as jumping, marching, running, and kicking and tossing bean bags and balls. The outdoors provides an excellent vessel for discovering the outside world. Children observe the birds and squirrels who inhabit our neighboring trees, listen for the church bells ringing from across the street, and observe the planes that fly high overhead. Our Toddler Class is a transitional program where children move from infanthood to early childhood. This is an age of substantial growth and development; you will be astounded by new things your child will begin to do! At meal times, children begin to eat on their own using a spoon and transition from a sippy cup to a regular cup. It is a messy experience, as many valuable lessons are, but these toddlers are becoming more independent by the spoonful! Our teachers are expertly trained to manage these interactions and teach children how to resolve conflict. Children are guided in center-based play, where they learn to dress up in a variety of costumes and hats, put together simple puzzles, paint with their fingers and brushes, and build simple structures. Through play, children learn social skills, turn-taking, and how to follow directions. All toddler activities are carefully planned with a purpose for optimizing your child’s development. Our Toddlers engage in two small group activities per day, in order to maximize the opportunity for structured learning time. Art activities are planned to support creative development and self-expression, as well as for refining fine motor skills and strengthening their small hands. Sensory play, where children learn by touching, smelling, listening, looking, and tasting, allow toddlers to experiment and discover in order to support cognitive development. Music and movement activities promote creativity and stimulate brain activity. A variety of materials are provided that support emerging concepts such as color recognition, shape recognition, and sorting. For inquiries and concerns, contact us at 210-822-7777. Ready to enroll your child? Fill out our online Enrollment form now.